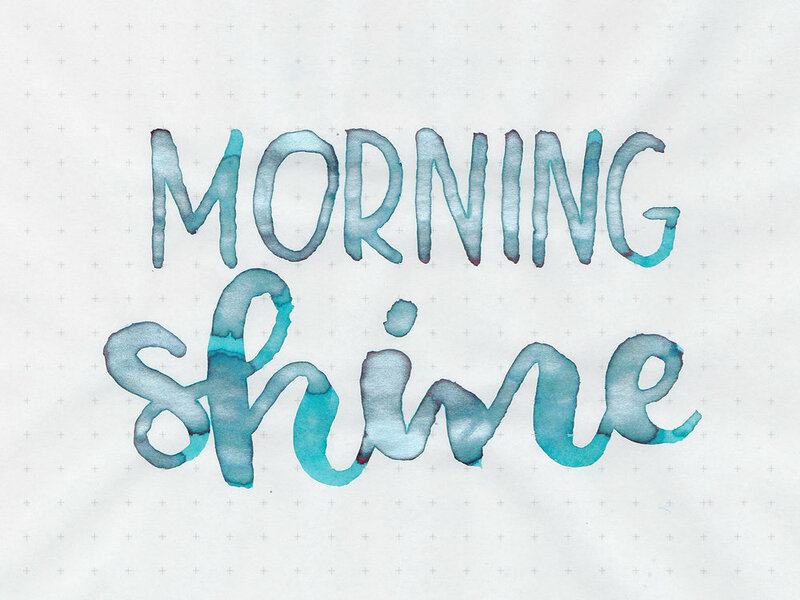 Today we are taking a look at Morning Shine, a new limited quantity Shake 'N' Shimmy ink from Robert Oster. Only 100 50ml bottles were made, and each comes with a letter of authenticity signed by Robert Oster. I purchased my bottle of ink from Pen Chalet, the only retailer in the US to carry it right now. Morning Shine is a medium blue-turquoise with lots of shimmer. My guess is that this ink is the shimmer version of Robert Oster Morning Mist, which I haven't reviewed yet, but will soon. Bleeding: Low-only in the swabs. Other properties: medium shading, a tiny bit of sheen, and tons of shimmer. I only noticed the sheen in the large swabs and ink drops on TR paper. On 20 pound copy paper the ink behaved pretty well, it did have a tiny bit of bleeding in the swab. 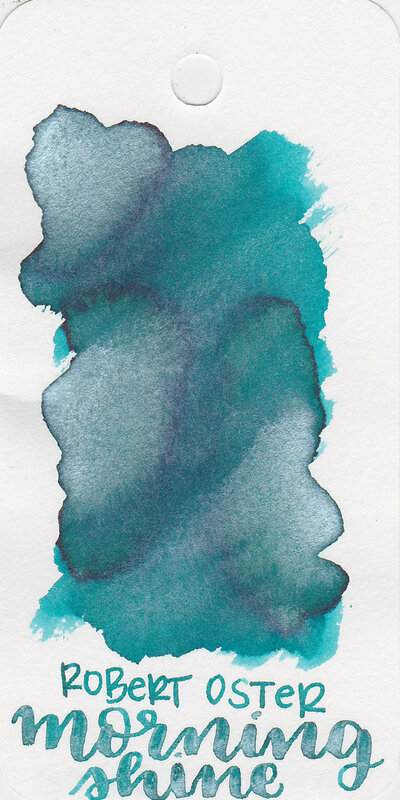 Ink swabs for comparison, left to right (top to bottom for mobile RSS): Diamine Spearmint Diva, Robert Oster Morning Shine, and Robert Oster Silver Fire and Ice. Click here to see the Robert Oster inks together, Shake 'N' Shimmy inks are at the bottom of the page. Spearmint Diva is more teal than Morning Shine, and Silver Fire and Ice is a darker blue. Robert Oster Tranquility, L'Artisan Pastellier Turquoise, and Robert Oster Fire and Ice. Click here to see the blue inks together. Tranquility is more teal than Morning Shine. L'Artisan Pastellier Turquoise is actually pretty close to Morning Shine, and Fire and Ice is more of a deep blue than Morning Shine. I used a Pelikan M400 White Tortoise with a vintage 400N on Tomoe River paper. The ink had an average flow. The shimmer clogged the pen twice, but I primed the feed just a bit and it worked again. The ink cleaned out easily with an aspirator. Overall, it's a lovely ink. It's pretty well behaved but has a ton of shimmer. I like this ink in a flex nib on white paper best, on smaller nibs it's hard to keep the shimmer consistent. Give it a try, you might love it.